Graebert, the CAD solutions developer have announced their Mobile CAD solution for dwg drawings, the Ares Touch app. The app is available for both Android and iOS devices. The Ares Touch app allows users to read, create, modify or annotate technical drawings in the popular .dwg format. It offers basic features for free but premium subscribers get access to more than 150 features for drawing and annotation. 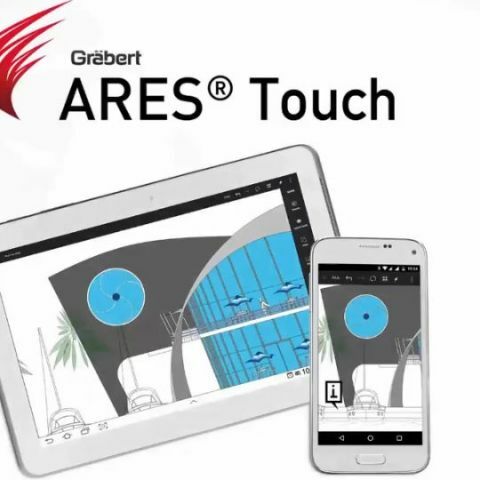 Graebert, the pioneer in developing high-performance CAD solutions across desktop, mobile and cloud, revealed today the latest state of ARES Touch, its full-featured Mobile CAD solution for dwg drawings. ARES Touch is a professional application for iOS and Android, designed to read, create, modify or annotate technical drawings in the popular .dwg format. While some viewing and features are available for free, ARES Touch subscribers get access to more than 150 features for drawing and annotation. ARES Touch is sold within a unique subscription combining three DWG-based CAD solutions interconnected to offer a unique user experience across desktop, mobile and cloud. The ARES “Trinity” of CAD Software includes ARES Commander (for Windows, macOS and Linux computers), ARES Touch (for Android and iOS smartphones or tablets) and ARES Kudo, a new cloud-based CAD solution. Any purchase of ARES Commander includes a one year renewable subscription for ARES Touch and ARES Kudo. Alternatively, a monthly subscription of ARES Touch can be purchased from the Apple App Store. Subscribers purchasing the monthly subscription from the Apple App Store are further invited to create a Graebert Account to enjoy ARES Commander and ARES Kudo at no additional cost. ARES Touch is now fully integrated with its cloud-based solution ARES Kudo. Connected with your cloud storages, ARES Kudo works as a hub synchronizing your files across all your devices and ARES CAD software. A user may for example annotate a drawing on site and his modifications will be seamlessly updated and synchronized with his computer or his colleagues at the office. ARES Touch is also completely customizable for large accounts and major developers. Powered by a custom API, it supports programming languages such as C++ Tx, DCL or Lisp, which allows developers to add workflow-oriented features and facilitates integration with other systems. Graebert’s mobile version also supports Mobile Application Management, which offered some customers of Graebert the ability to deploy ARES Touch on thousands of iPads without the hassle of manual installs. MDM versions of ARES Touch can also be customized to the needs of Graebert’s customers by limiting for example the cloud storages that are allowed in the company.